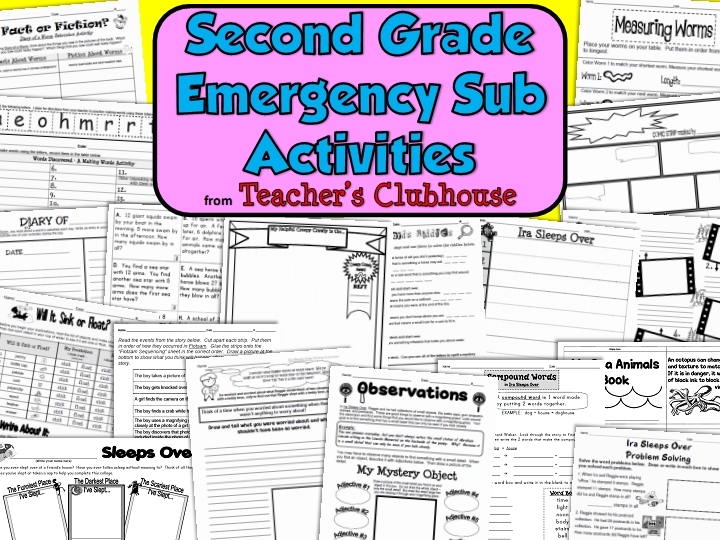 The next most popular item(s) on our Teacher's Clubhouse wishlist is our 2nd and 3rd Grade Emergency Sub Units. Can I just say that these things have saved my tush a time or two?? This is why I think our sub units are so amazing. 1) They offer 3 days worth of activities in ALL subject areas! THREE DAYS WORTH!! 2) Each day focuses on a picture book. The sub reads that book aloud to the class and ALL activities for the day will center around that book. Everything from reading to writing to math to science/social studies to word work....yep, everything! 3) There's minimal prep - just print the pages, prep what's needed, store with the book and you're ready for those emergencies! 4) Many of the books used will be either well-loved classics or newbie favorites that your students will love! 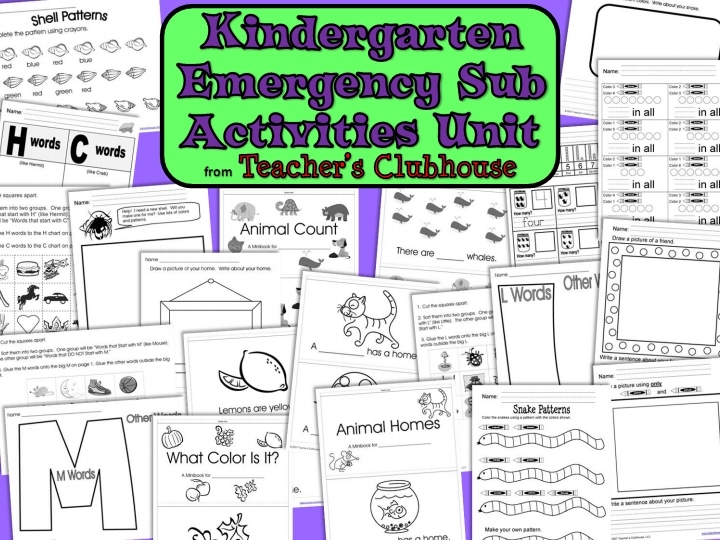 We have the Emergency Sub Activity Units available for grades K through 5. Here's a sneak peek and the books that are used for each grade. 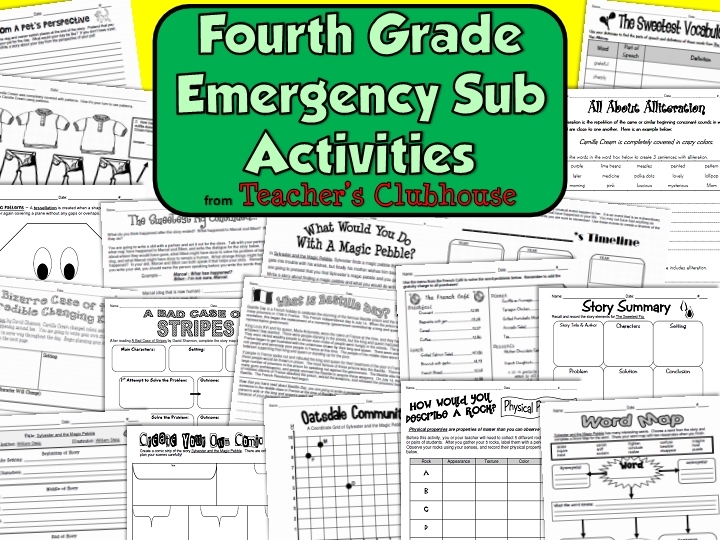 I create a "Sub Tub" and leave these printables along with the picture books in there for emergencies. 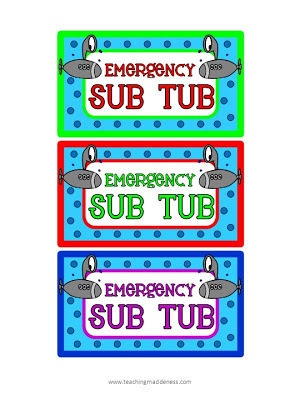 You can grab my Sub Tub labels HERE for FREE! If you'd like to win one of our Emergency Sub Activity Units, just comment below with your email and the grade that you would like. We'll choose a winner Thursday night! 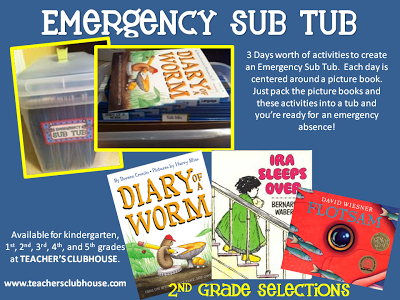 All of our Emergency Sub Units are on sale in our Teacher's Clubhouse TpT shop for 30% off through Friday! 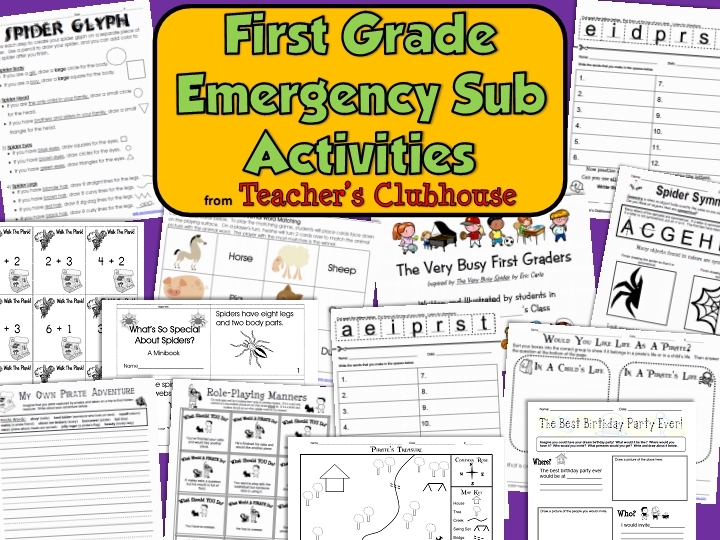 I would love first grade's sub packet! This looks amazing! Pick Me!! Pick Me!!! LOL I would LOVE to win a 2nd grade pack!! khuston56@aol.com They look AMAZING!!!! Amazing product! I would love to win the 3rd grade pack. Thanks so much. Third grade seems to be the popular set ... that's the one I'd love to win, too! What a great idea to offer as your Wish List Winsday giveaway! Thanks for the chance. I've looked at the 2nd grade set several times before but purchased other things instead...I'd love to win it!! Your WishList WINSdays are my favorite because I always want to win (or buy if I don't win) whatever you showcase. I'd love the 4th grade set! Ohh, I would love to win the 3rd grade sub tub! It looks awesome! I would love the third grade set. It's a new level for me. I would love a 2nd grade set of these. I need my tush saved every once in a while!!!! This will be so helpful with a brand new baby in the house! I would love the second grade set! Just yesterday my new principal informed us that we'll need to create 3 days of Emergency Sub Plans and then I see this! Perfect! I would definitely love to have these in my 4th grade classroom. Happy Anniversary!!! 15 years...that's amazing! Yay! What a great giveaway. I'd love the kindergarten sub tub plans. Thanks for the offer. 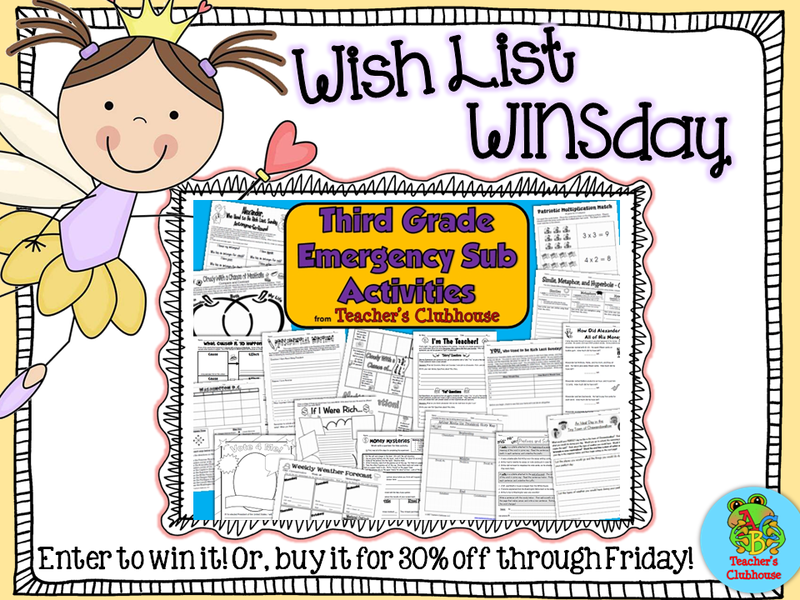 This year will be my first year teaching 3rd grade, so I would absolutely love to win the 3rd grade sub tub! You're amazing for putting something like this together! Thanks! I would love to win this sub packet. I teach Kindergarten. Thanks! 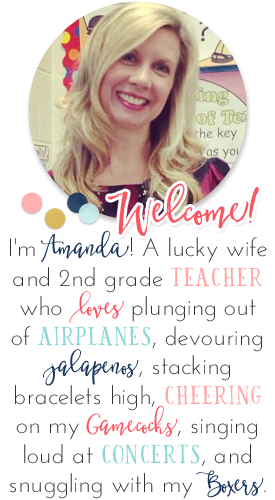 I would love a chance to win your second grade set! I would love, love, love the 1st grade set. 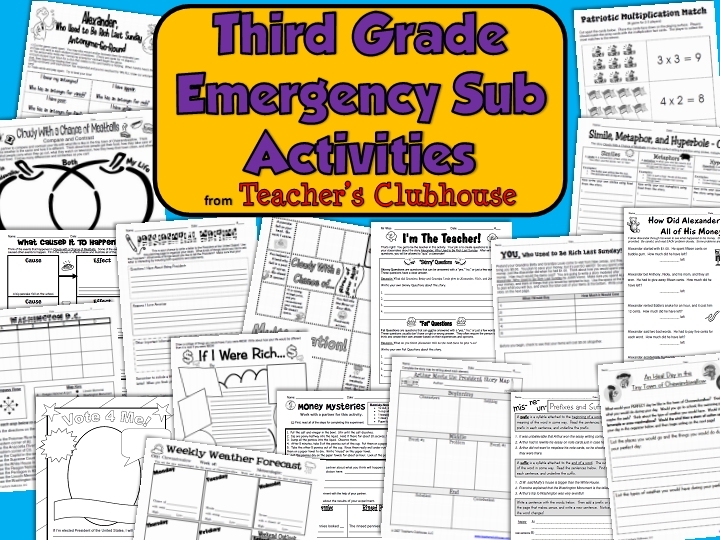 The Emergency Sub activities look awesome! I would love to win the 2nd grade set. Awesome! Third Grade set for me would be great! Thanks! This sounds awesome! I would love the Kindergarten set. I didn't call in sick one day last year because it was easier to come to school than write the dreaded sub lesson plans! The 2nd grade product would be perfect for me! I would love to win this! Planning for a sub is SO time consuming! Your products are amazing! Can't wait to start using your Team Homework products this year! Brilliant idea! I'd love the 3rd grade pack! This looks like a wonderful thing to have! I would love the 2nd grade pack! I would love the grade 3 pack!!! I would absolutely love to win the 3rd grade pack. I have been working on my required sub plans, because I am probably going to need it this year. My mom is quite ill, and in the last stages of Alzheimer's. Having quality activities for the students would be wonderful! I would love to have the first grade one! I have been wanting to make subtubs for the longest time. This is my 2nd year teaching fourth grade, and these would be perfect! I would love the 2nd grade tub!! I would love this for 1st grade! I would love to win the 2nd grade activities! This would be awesome to win! I would love to win the 5th grade activities! My team also loved your homework ideas and are currently trying to adapt it for our 5th grade team. Thank you so much! 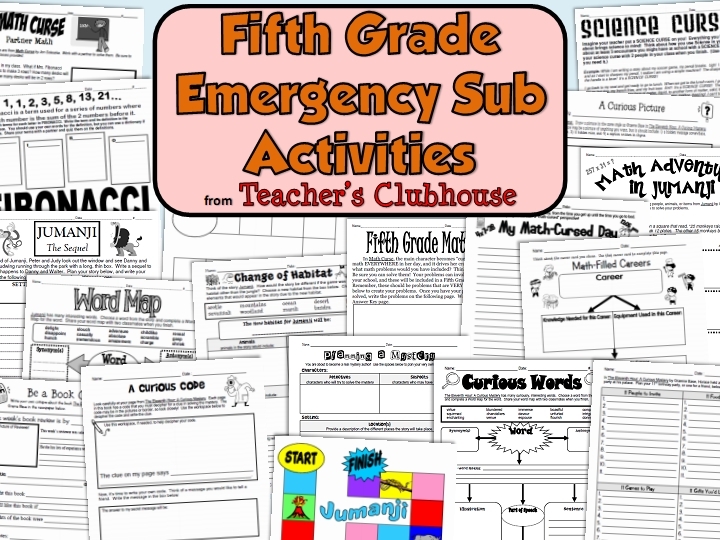 I'd love your 5th Grade Emergency Sub Activities. Thanks for the opportunity. These look great! 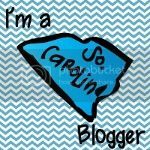 I just discovered your blog tonight and am loving it! I would love a set for 2nd grade. Would LOVE the third grade pack! Had to take some emergency time off last school year (had an early baby!) and if it wasn't for my fantastic teaching team, the poor sub would have been lost. This is a great way to keep organized and offer lesson ideas with no fuss. 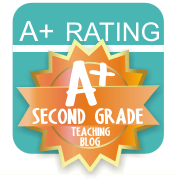 Second grade would be great! Woo hoo! I'd love 2nd grade! Awesome! I teach 2nd grade. I LOVE how you have your units organized in the tubs. Presently, I'm reorganizing my units from files into tubs. Do you sell the tubs labels? Thanks for creating this sub tub set. I am a second grade teacher and would love to win it.